I needed Turkey. After a long time in Eastern Europe and the difficulty of our tour through Bulgaria I was ecstatic to enter a new culture and have the promise of a swim in the ocean. We came into Turkey through a beautiful, but expensive, border crossing near Edirne, the old Ottamen empire. With a peacock (yes an actual live peacock) and dark clouds overseeing our journey, we felt we must have been blessed. It was only 10km to the town and we looked forward to well deserved rest days and exploring the famous Suniyeli mosque. As expected Turkey was a very welcome change of pace. We stayed in what for us was a really nice hotel, and we treated ourselves to Gozleme (fried flat bread with cheese) and salad. Unfortunately beer is a bit more difficult to come by in Turkey, but I was able to find a local shop that sold Effes and we enjoyed the sounds of traffic and the regular call to prayer with a couple of pints (granted it must have seemed incredibly foreign to the locals for me to be buying these beers because I was asked to take selfies with the girls behind the counter with me holding up empty beer tankards). I was exhausted the next day but I knew a massage could be exactly what I needed. After a recommendation from my sister-in-law I went in search of the Hammam (or Turkish bath) which was actually adjacent to the famous mosque and must have been part of the building in times past. Not knowing what to expect but delighted with the possibility of being able to pamper myself, I was ushered in by two ladies having tea outside to the Hammam. In broken English they explained that I should undress and get into the robes provided in my private changing room. I would then be assisted with a full body scrub, a salt based skin treatment, bubble massage and a facial. Being as I had probably never felt as dirty as I did then in my life, I gave myself over to the attendant readily. I think she must have been surprised by the state of me because she scrubbed all of the skin on my body to a point where I am sure there was only my baby layer left. That probably doesn’t sound that pleasurable, but it really was! and I hadn’t felt so clean and refreshed in months of cycling. During our final day in Edirne we visited the beautiful Sunyeli mosque. Wandering through the bustling streets in the city really helped to solidify our feeling that we were in a refreshing new culture which we could take time to readjust to and enjoy. 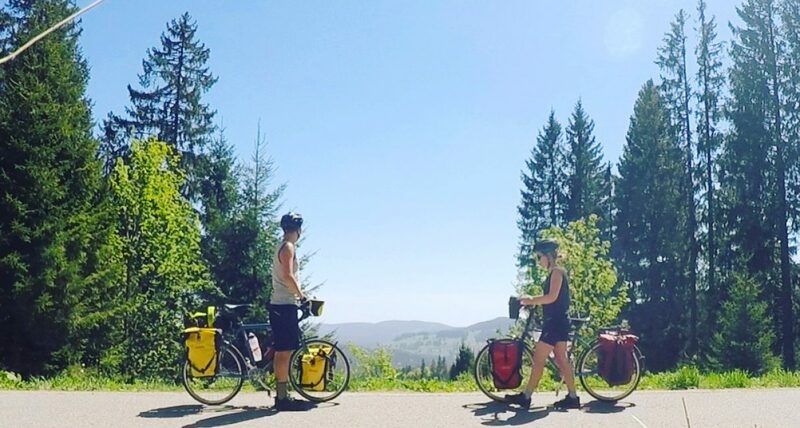 Bike touring is an amazing way to travel because as I discussed before, you really get a chance to relax into places and see them at a slower pace, but sometimes that can also be frustrating and you become anxious to experience a new culture. Turkey was the cultural change that I think we both needed to get back into enjoying the tour and return to our excitement for reaching Istanbul. We needed to get to Istanbul in a little over a week a half to meet family and we estimated that after Edirne we only had 4-5 more riding days left to get there. This left us a really nice cushion (and excuse) to have a holiday at the beach. Through very quick and excited perusing we found what looked like a small beach on the map, in the town on the opposite coast from Gallipoli, only two days ride away! I found the riding in Turkey to be much more pleasant than the riding in Serbia or Bulgaria mainly because it was safe. All the roads we took in Turkey were main roads with very large hard shoulders giving us more than enough room to ride side by side, but the problem with riding on large roads is that it is not necessarily enjoyable for five hours. We were relatively lucky to have it only be about 32 degrees C (90F) in late July when it could have easily been well over 40C (104F), but those kind of temperatures can still feel really oppressive on the exposed tarmac. It definitely wasn’t easy riding with the hills, dust from the roads, constant traffic and heat but somehow the generosity of the people in Turkey made it much more tolerable. Because we are huge tea lovers we found reasons to stop regularly, and in Turkey… and lucky for us, a Chai is always available. Everywhere we stopped people wanted to speak to us about our journey and several times they wanted to help us on our way. On our first day out of Edirne whilst we were climbing our final brutal hill to our hotel we were stopped by an old man coming out of the bakery. We soon found out he was the owner of the bakery and he wanted to give us a loaf of bread to help us. I begged him to take some money for the loaf but he refused, kindly gesturing for us to continue on our journey. Several other times we were given Chais, fruit juices and water and once people even bought us two beers. It was a long climb before we saw the ocean over the horizon. After months on the bike it felt like we had waited a lifetime for this moment. We raced the rest of the downhill and decided as soon as we arrived that we would stay put for a few days and extend our time on this (local Turkish people only) beach. Now fully recovered from the strenuous riding in Bulgaria we allowed ourselves to be lazy. We slept in every morning and indulged in a day of diving. It was relaxing and refreshing for the soul but the end of the journey and finishing this chapter loomed over our hearts and minds. Leaving the beach we took a ferry from Gallipoli and crossed the continental divide into Asia. We smiled together and briefly celebrated our crossing a continent using only peddle power. With only two big days of riding left we falsely felt we had already finished our mission, but as with every experience on the tour we didn’t know what to expect. The final 200 kilometres was incredibly slow due to the strong headwind that had settled in. Every pedal rotation felt like pushing through molasses and our average speed dropped to our lowest since the tour began. Brow beaten, and incredibly frustrated with the riding we gave ourselves one more day at the beach before hopping on our ferry to central Istanbul from Banderma. The two hour ferry dropped us off two kilometres from the Blue mosque where we had scheduled to meet my mom and celebrate the finish of this part of our journey. Finishing the journey through Europe felt surreal; whether it was the change of pace, or meeting with family, or the intensity of entering Istanbul… I am not sure. I went about site seeing without really thinking that we needed to send back the bikes and turn our thoughts and planning towards India. We visited all the major sites in Istanbul including the (not so impressive, I would miss it out if I travelled back) Blue Mosque. Also the Aya Sophia, Basilica Cistern, (the incredibly impressive and my favourite thing we saw) Topkapi Palace and the Archeological Museum. We also took a cruise down the Bosphorus, went for another Hammam (much more westernised and fancy – amazing but not as authentic as the one I attended in Edirne) and went to a performance of the Whirling Dervishes. If you add in the drinks and food, we actually had very little time to digest the fact that we had just rode our bikes for nearly 4500km across Europe. Finally after almost a week in Istanbul, we took the bikes down to a bike shop in the centre of the city which was recommended to us by a contact on Warmshowers to have them packed and readied for shipping. We would soon learn that much like everything we tried to book and plan for in Turkey, shipping the bikes was going to be very difficult. The next day we went to pick up cheap backpacks and in the afternoon we visited the bike shop to take the packed bikes to the Turkish post office (PTT) – which was about a quarter of the price to ship the bikes compared to known international couriers. Because of some of very strange packing rules, which even the post office employees seemed to be unaware of, and which were obviously not published on their website (because that would be way too logical!) the bikes could only be shipped in a container no more than a metre long. The bike shop knew of this rule and packed both bikes together, unaware that apparently there were also weight, height and width restrictions. After nearly four hours in the sweltering and packed post office over a period of two days and as well as having to have the bikes repacked three times we were finally allowed by the the Gods at the PTT to ship our bikes back to England (We don’t actually know yet if those Gods will actually help them to arrive in London). Feeling somewhat naked and vulnerable without our bikes and very light with our new 6kg backpacks and two small carry backpacks, we finally felt ready for our flight to Kochin, India. For at least a short while we were ready to say ‘Goodbye cycling, hello life on foot and public transport’. I wondered how our pace of travel would change without bikes and if we would, as planned, ride them again through Southeast Asia. It was obvious we were once again travelling into the unknown, unprepared. With the end of this journey looming and the prospect of family coming to meet us In Istanbul, we concluded we wanted to take the most direct route to Istanbul over the Balkan Mountains. We started mapping our route without our trusted Eurovelo map and only an idea of what roads others had used previously when going to Turkey this way. Serbia had been an experience and now we were ready to enter Bulgaria, finishing our journey on the Danube and heading into the mountains from Oryhavo. Cycle touring mates we had met on the journey informed us that we could get to Oryhavo quicker, and with less hills, by taking the road on the Romanian side of the Danube. Having heard from many along our journey about the dangers of Romania, including the wild dogs and the potential of being robbed, I was understandably a bit dubious about the journey. We planned to ride 100km in one day from the Bulgarian border to the Romanian border where we would cross back into Bulgaria with a ferry. We woke up early and were excited to see horse and cart road warning signs in front of us and we didn’t have to wait long to see the horse and carts in person (for a while there were more of them than cars on the road). It was a delightful change from the racing drivers of Serbia with the much more pleasing sounds of clip clopping along the roads as opposed to revving engines. The journey through Romania was refreshing, the towns, although obviously poor, were welcoming and friendly. Children ran up to the bikes to give us high fives and most of the people along the roads and driving by waved hello. My partner was challenged to races with young boys who were also on bicycles. There were a couple of dog chases which, in reality, were more startling than terrifying. I kept my speed on the bike and stared at the dogs hard until they tired out and gave up the chase. This approach seemed to work fine for us. We wound up really enjoying our day in Romania. We concluded our time there with a beautiful evening, a cold beer, some very different Romanian food, (curried chicken, polenta and a fried egg) England’s last contentious game in the world cup and a chat with our friend, the rotund cycle tourer, who happened to be spending his evening at the same motel. Relatively disappointed to leave Romania we looked towards Bulgaria and the mountains that would be the final challenge of this stage of our journey. I have to admit I didn’t enjoy our time in Bulgaria. We were able to ride through the country in only 7 days (with one day of rest), and unfortunately I found every day of those 7 days difficult. Admittedly I did work on our rest day and I probably should have taken the time for my body and mind to heal, but whatever it was I couldn’t bring myself to get past the pain of cycling and actually enjoy the jouney and the culture. I was disappointed because I had really looked forward to Bulgaria since two of my best friends in college were Bulgarian and when we got our first room in London we shared the house with a few Bulgarians who were some of the nicest people I have ever met. True to my stereotype, the Bulgarian people were warmer than any we had met in a long time. The towns we visited were relatively charming and the food and accommodation had definitely improved since Romania and Serbia. There was a definite feeling of ‘up and coming’ in Bulgaria. You could instantly tell that this was a country that was modernising and changing quickly. We needed to ride major roads to make it through the mountains efficiently and I can say pretty confidently that ‘Those roads are not meant for bicycles’! There were no hard shoulders to escape onto and even on dual lane roads the drivers chose to drive as close to you as possible and not take up a position in the other lane, as would seem sensible. We road in line as close to each other as possible with as much high vis gear and as many twinkling lights as we could manage to put on. My partner even attempted swaying into the road behind me with the intention of making drivers more aware of our presence, but nothing seemed to help. It often felt like we were sitting ducks waiting to be picked off and we would entertain ourselves on every ride by counting down the miles until we managed to leave one major road for another. We hadn’t stayed with a Warmshowers host since Germany and it had gotten to a point where we missed the opportunity to get to know a place through the people that lived there. My partner booked us a host for the evening after our hardest climb in the Balkans. Shipka Pass is a 14 mile climb up a twisting road with an average 6-7% gradient. Lucky for us the traffic was actually not that bad, and relatively slow moving. With my partner happily taking in the views and enjoying the mountain breeze, I was pedalling hard and trying to focus on the climb. After 1200 meters we did make it and then we walked the last obligatory stairs to see the war monument and views, which were breathtaking. Unfortunately however the conclusion of the ride was weighing on my mind, I was petrified of the tight turns at steep gradients that I knew were awaiting us. Like a grandma on a bike I did come down the slope at minimum speed, however as soon as we made it over the mountain the heavens opened. We arrived to our Warmshowers host exhausted and soaked through. Like all of our previous hosts, the Bulgarian family was welcoming and accommodating. We passed out in his unfinished upstairs apartment after the ride and woke up famished and bleary eyed. We had dinner with the family and discussed what sounded like fantastic mountain bike trails around the country. He wasn’t surprised, and actually agreed with us, about Bulgarian drivers and roads. We had hoped he would be able to help us alter our route so that we could continue on quieter roads but unfortunately he generally agreed with the routes we had mapped and we knew there would be a few more days of pain in store for us. I was exhausted and deflated by my experience in Bulgaria. Since Begrade we had been riding hard with only a few rest days. We were climbing more than we had since the Black Forest and we were following our own route on busy, scary roads. I felt at saturation point with the bike touring and I knew the only cure for this feeling was the experience of entering an entirely new culture and finally seeing the sea. Again we got up very early on our last day in Bulgaria and road as quickly as we could to the Greek border, we road for 35kms through the rolling hills of Greece until we finally came to our last border crossing on this part of our journey. With tears of joy brimming in our eyes we entered Turkey and knew we would soon swim in the ocean. My Travel Diary Blog at WordPress.com.